Dr. Tse is interested in the rich and surprising physics emerging from confined electrons or photons in low-dimensional quantum materials and cavity systems. His recent research focus has been centered on light-matter interaction and optical properties as well as quantum spintronics in new 2D materials and heterostructures. Dr. Tse received his Ph.D. from the University of Maryland in 2008. He was a postdoctoral researcher at the University of Texas at Austin (2008-2013) and held a Director’s postdoctoral fellowship at the Los Alamos National Laboratory (2013-2015). 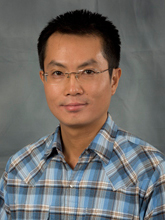 Dr. Tse joined the faculty of the University of Alabama in 2015.